Really disappointed with the amount of stages in this game, and the ones available. All the good ones are just from past games. And they kept a lot of ones from Brawl that make me scratch my head. Why didn't they keep New Pork City? @SuperLuigi111 I only had the 3DS version, but I wasn't particularly impressed with the stages in it. I think the 3DS version has better stages. It didn’t have any annoying giant stages for starters. 3DS has more stages than the Wii U somehow. Nintendo better deliver with Ultimate. Brawl and SSB4 are disappointments. What are you talking about? 3DS has 42 stages and Wii U has 56 stages. Seems like it has more. It definitely has a lot of good stages that are nowhere to be found on the Wii U version. A lot of new versions at that. Wii U makes use of a lot of recycled stages, while offering almost nothing new that is worth playing on. 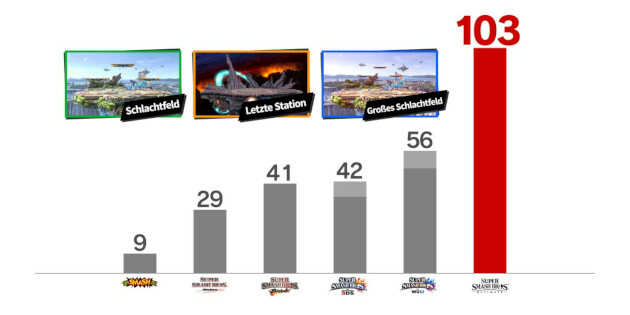 @SuperLuigi111 3DS has 12 returning stages (14 if you count Battlefield and Final Destination), Wii U has 21 returning stages (23 if you count Battlefield and Final Destination), Ultimate has at least 96 returning stages (at least 99 if you include Battlefield, Big Battlefield and Final Destination).